Putting the essential requirements of expertise and experience aside, I’d say the Number 1 consideration is whether you feel you have a good fit, personality wise. Do you feel comfortable with him or her? Do you think you’d be happy to have them by your side throughout arguably the most important day of your life? Your videographer could well be the person who settles your nerves with a kind word just before you walk down the aisle. She or he will see you at your most vulnerable and hopefully at your most joyous! Do not underestimate the importance of choosing someone calm, unflappable and, of course, utterly professional. With more than 50 weddings under my belt, I believe I am that person. My clients attest to me being a friendly, warm and calming presence on their wedding day. And, of course, they say that I get the most amazing footage to create a video of their big day which they will treasure for years to come. Is my style your style? Creating a wedding video isn’t just a matter of ‘Roll camera!’ All wedding videographers have their own approach to capturing the story of your day and it’s important that their style is a good fit with your style. The best way to find out whether you think I might be the right videographer for you is to look through examples of my work on my website or on YouTube and get a real feel for what I do. I always take a bespoke approach, which means that I will listen and adapt the style of filming according to your needs, but previous wedding videos will definitely guide you towards making your decision. As wonderful as your wedding day will be, getting married can also feel overwhelming at times. Which is where a calm, unflappable presence is worth its weight in gold. Clients tell me I am a discreet presence at their wedding, calmly moving about with my cameras without bringing attention to myself. 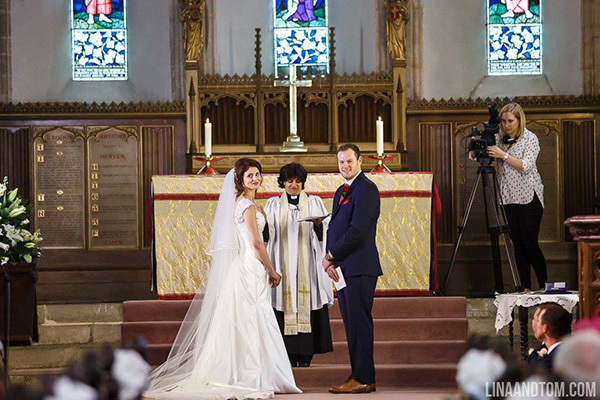 Some brides have said their guests didn’t even realise there was a videographer at the wedding! The best wedding videographers are a barely noticeable presence on the day (although hopefully you will notice me in a good way!) but still manage to capture all those magic moments. To pull this off takes charm, expertise and experience. Quite a unique skill set, even though I say it myself! Do get in touch to find out how Ellen Jackson Videography can help capture your big day. Call me on 07912 119543 or email me on ellen@ellenjackson.co.uk Visit my website http://ellenjackson.co.uk to look at examples of previous weddings I’ve filmed to find out whether my style is your style.